We want to help you with some useful information to find your way around the forest of banks. If you prefer to obtain our advice personally, please contact us at hitel@gdn-ingatlan.hu and our experienced colleagues, with proven expertise, will contact you. The aim of the loans is the purchase and modernization of new, and also used homes. A subsidy is added to the new housing loans when the price of the building lot and the price without VAT are less then HUF 30 million. 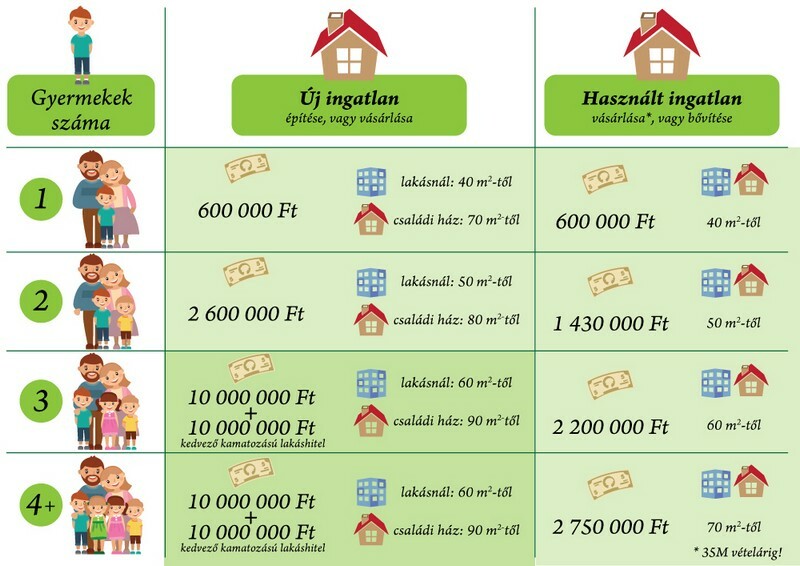 The upper limit of the purchase price is HUF 20 million at buying a used home, and the investment cost can be up to HUF 15 million at modernizing. There can be significant differences among the banks’ offers, so we recommend obtaining tender bids of banks using our loan centre. A non-refundable one-time grant from six hundred thousand HUF to 10 million HUF - depending on the number of children. The subsidy for the construction of new homes, or for the purchase of new or used home can be obtained by those, who do not have real estate (with a few exceptions)! For anyone who applies for the subsidy, at least one parent needs to have at least 6 months of employment annually, and have no government debt. ..., that you are entitled to another 30 % state subsidy on top of your monthly savings, which you can use to cover almost any investment related to real estate? After the annual deposit payments, the state provides 30 % tax and fee free state subsidy not to be repaid, not exceeding HUF 72.000,- yearly in the saving period. State subsidy is only for housing purposes, and it is available in case of a minimum of 4-years-long savings and it can be obtained for up to 10 years. Why should you entrust the GDN loan centre with the administration of your loans? • Our loan team experts remove all administrative burdens from your shoulders, you only need to choose the right loan construction! • We provide our many years of professional experience to assist with the selection of the best loan construction! • The size and connection network of the GDN Loan Centre ensure the speed and fluency of our administration! • The service is free of charge for all individuals, since fees are borne by the financial institutions! • The loan construction is never worse than if you directly contact the financial institution for a loan. In fact, we can often obtain better conditions for you! • Instead of inflexible bank opening hours, you can arrange your affairs when it is suitable for you. By prior arrangement, it can be even arranged for either before or after the working hours, and even on weekends! The GDN Loan Centre is almost never closed! Ask for a call by our experts, and experience what it's like when banks compete for your business!